A workbench is used to improve armor, as part of Smithing. Materials such as ingots or leather are required to make improvements. Different types of armor require different materials. 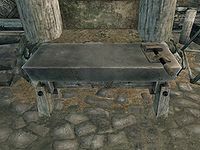 There is at least one workbench in every major city, as well as in some smaller towns and various forts and ruins located around Skyrim. A category list of locations with workbenches can be found here. This page was last modified on 11 April 2019, at 08:10.